One of award winning builder Richard Laughlin’s creations is a limestone rock home designed from a turn of the century Australian outback home with the decor of “Victorian Ranch”. Many of our guests have enjoyed Richard’s other creations, Double Deer Ranch, Inspiration Hill, Anastasia, & Francesca’s. The aged metal roof on Diamond Belle is topped with a cupola. Lattice conceals the private front porch. Inside this one room home is a wonderful queen-size bed with an extraordinarily unique Mission style head and footboard. An array of wonderful fabrics have been tastefully combined and layered to create an awesome duvet cover. To emphasize the bed, a large mirror is featured on the wall behind the headboard. In the middle of the room hanging from the glass cupola is a masterful chandelier surrounded by natural wood ceilings adds that perfect touch of elegance to this rustic cabin. Limestone floors showcase an array of rugs including animal skins. The large romantic whirlpool tub is surrounded by a collection of antique mirrors, but there is also a separate bathroom with a shower and a fabulous antique vanity. The coffeebar has a microwave, small refrigerator and coffeemaker. Double doors lead to a “grouse” porch and courtyard. Cedar fencing surrounds the courtyard creating a true sense of privacy. As in Richard’s previous creations you will find an outdoor shower (not available in the Winter). There is also a charcoal grill. 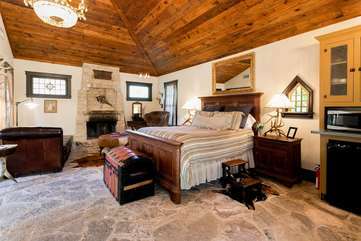 Located only a few miles from Fredericksburg “in the bush” this romantic home is a “fair dinkum beaut”. As they say in Australia “give it a burl”, bring your “coldie” enjoy a “bludger” evening, and you will discover that your stay is “rapt”. A 10% discount is offered to active military. I.D. required at check-in. Clean and cozy! A great place to relax. It has the necessity amenities. Just got back from our stay at Diamond Belle and we enjoyed every minute. The cabin was in a perfect secluded setting and beautifully furnished. My favorite part was enjoying our morning coffee on the back patio listening to the water feature and birds chirping. Fredericksburg was a short five-minute drive away and it was nice to be out of the hustle and bustle of downtown! Great location, not too far from town but far enough to be isolated. Love the privacy you get from owners. My husband and I love this place and we will be back soon.